Jeremy Bentham (/ˈbɛnθəm/; 15 February 1748 [O.S. 4 February 1747] – 6 June 1832) was an English philosopher, jurist, and social reformer. He is regarded as the founder of modern utilitarianism. Bentham defined as the "fundamental axiom" of his philosophy the principle that "it is the greatest happiness of the greatest number that is the measure of right and wrong". He became a leading theorist in Anglo-American philosophy of law, and a political radical whose ideas influenced the development of welfarism. He advocated individual and economic freedom, the separation of church and state, freedom of expression, equal rights for women, the right to divorce, and the decriminalising of homosexual acts. He called for the abolition of slavery, the abolition of the death penalty, and the abolition of physical punishment, including that of children. He has also become known in recent years as an early advocate of animal rights. Though strongly in favour of the extension of individual legal rights, he opposed the idea of natural law and natural rights, calling them "nonsense upon stilts". Bentham's students included his secretary and collaborator James Mill, the latter's son, John Stuart Mill, the legal philosopher John Austin, as well as Robert Owen, one of the founders of utopian socialism. On his death in 1832, Bentham left instructions for his body to be first dissected, and then to be permanently preserved as an "auto-icon" (or self-image), which would be his memorial. This was done, and the auto-icon is now on public display at University College London (UCL). Because of his arguments in favour of the general availability of education, he has been described as the "spiritual founder" of UCL. However, he played only a limited direct part in its foundation. 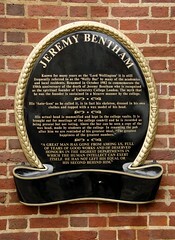 JEREMY BENTHAM Known for many years as the 'Lord Wellington' it is still frequently referred to as the 'Welly Bar' by many of the academics and local residents. 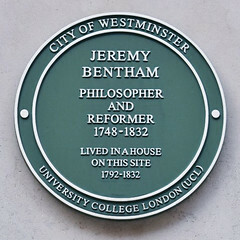 Renamed in October 1982 to commemorate the 150th anniversary of the death of Jeremy Bentham who is recognised as the spiritual founder of University College London. The myth that he was the founder is sustained in a bizarre manner by the college. His 'Auto-Icon' as he called it, is in fact his skeleton, dressed in his own clothes and topped with a wax model of his head. His actual head is mummified and kept in the college vaults. It is brought out for meetings of the college council and he is recorded as being present but not voting. Above the bar can be seen a copy of the wax head, made by students at the college In renaming the pub after him we are reminded of his greatest ideal, "The greatest happiness of the greatest numbers." "A GREAT MAN HAS GONE FROM AMONG US, FULL OF YEARS OF GOOD WORKS AND OF DESERVED HONOURS IN THE HIGHEST DEPARTMENTS IN WHICH THE HUMAN INTELLECT CAN EXERT ITSELF. HE HAS NOT LEFT HIS EQUAL OR HIS SECOND BEHIND HIM"